I know many people are intimidated by pie dough, and rightly so. It’s tricky. I’ve probably had more kitchen tantrums trying to make pie dough than anything else. It’s hard to get the proportions right, it’s hard to roll out properly and even if you can roll it out it’s trecherous getting it from countertop to pie plate. I know. But keep trying because it’s worth it. And one piece of advice I can offer is when you’re rolling out your dough keep it moving. Roll a little, then pick up and turn a quarter turn. Roll a little more and throw more flour under the dough (many recipes caution against using too much flour when rolling the dough out but it’s the only thing that works in my experience). Once you’ve rolled it into the size you need, fold the dough in quarters and transfer to the pie plate. Of course it’s good to keep everything chilly as you’re working with it and that brings us to one of life’s cruel ironies: the best time to make pie is when fruit is in season, i.e. summer, but that’s also the hardest time to work with the fragile dough. There are a couple of major pie-dough belief systems and I am a proud member of the all-butter sect. I just don’t like Crisco for many reasons, one of which is it’s so darn hard to clean up because it never dissolves. Primarily though, I just think an all-butter dough is the way God intended pie to be cooked and Keller agrees with me. Not long ago Cook’s Illustrated came up with a “definitive” pie dough with the unusual addition of vodka. From the reviews I read many people loved it and found it much easier to work with. Personally, I was not a fan and could detect the vodka in the finished product. And not in a good way. 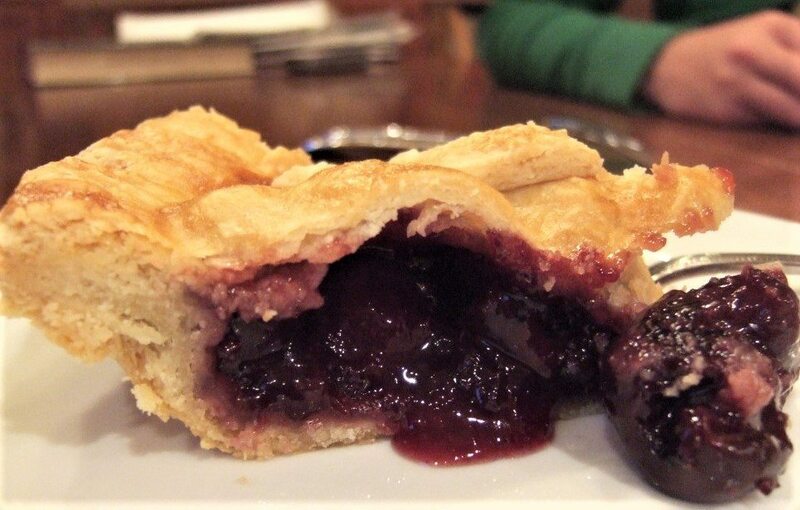 The other nice thing about this recipe is that it uses sweet cherries, which are around much longer than the tart ones. Before you make this, however, invest $12.49 in an Oxo Cherry Pitter. You’ll thank me later. And you can use if for olives too. About 5 tablespoons ice water. Combine the flour and salt in a large bowl, then add the butter and toss to coat with flour. With your hands or a pastry cutter, work and the butter into the flour, tossing and incorporating the pieces of butter that have settled at the bottom of the bowl, until the butter pieces are no larger than a pea. Drizzle 1/4 cup of the water over the top and, using a fork, mix the dough until it just holds together when pinched; add the remaining tablespoon of water if the dough is very dry. Knead the dough until it is completely smooth and the butter is incorporated. Divide the dough in half, with one piece slightly larger than the other (the larger piece will be for the bottom crust). Shape each half into a 1″-thick disk, wrap tightly in plastic wrap, and refrigerate for at least 1 hour, or for up to a day. (If the dough does not rest, it will shrink as it bakes). If the dough is too hard to roll, let it rest at room temperature for a few minutes or pound it a few times with a rolling pin. Lightly flour the work surface and a rolling pin. Lightly dust the top of the larger disk of dough with flour and roll it out to a 13-14″ round, turning dough and sprinkling flour under it as necessary. Fold dough into quarters and transfer to a 9″ pie plate, gently easing the dough into the corners and up the sides. Trim the excess with a scissors or paring knife. Roll out the second piece of dough in the same manner, to a 12″ round. Place on a parchment-lined baking sheet. Refrigerate both doughs for 15 minutes. Combine the cornstarch and water in a small bow, stirring to dissolve the cornstarch. Put 5 cups of the cherries in a large bowl; set aside. Put the remaining 2 cups cherries in a food processor and puree. Combine the puree and sugar (3/4 or 1 cup depending on the sweetness of the cherries) in a medium saucepan, bring to a simmer over medium heat, and simmer for about 30 minutes, stirring often to prevent the bottom from burning, until the mixture has reduced to 1-1/4 to 1-1/2 cups. Reduce the heat to medium-low and, stirring constantly, add the cornstarch slurry (remix the slurry right before adding). Bring to a boil, stirring, and cook until the mixture becomes translucent again. Remove from the heat, stir in extract, and let cool completely. Revove top and bottom doughs from the refrigerator. Position one oven rack in the bottom of the oven and the other in the center and preheat the oven to 400 degrees. Stir the puree into the whole cherries and pour into the pie shell. If the top crust is too hard to shape, let it rest at room temperature for a few minutes. Moisten the rim of the pie shell with some of the beaten egg. Cover the filling with the top crust and press the edges together to seal with the tines of a fork. Brush the top crust with the beaten egg and sprinkle with sugar if desired. Using a paring knife, cut a few slits in the top of the pie for steam vents. Cover the edges of the pie with aluminum foil that has been sprayed with cooking oil spray (i.e. Pam) to prevent the edges burning. Place pie on the bottom rack of the oven and bake for 20 minutes. Lower the heat to 375, remove the foil from the pie, move the pie to the center rack and bake until the crust is golden and the filling is bubbling, 25-35 minutes. Transfer the pie to a cooling rack to cool. The pie is best served 2-3 hours after it is baked, but it can be kept at room temperature the day it is baked or wrapped and refrigerated for up to 3 days. Looks beautiful! Am a Crisco user though, that’s the way my Nanna taught me (I’m sure it was a Depression thing), but will give the all butter crust a whirl. Did you use the vanilla or almond extract? Someone else I know used the vanilla and did not care for it at all. I used vanilla but I have used almond in cherry pie in the past and really liked it. I think the two flavors work very well together. Thanks for reading! Your crust looks so….buttery! You are convincing me to skip the crisco on my next crust. Yes, it does just seem “wrong” somehow.